May 29, 2009 By John P.
camera which is capable of up to 1,000 frames per second of video capture for a specific project that I’m working on which you guys will see pretty soon… But in the meantime I took a couple of sample videos just testing it out so far. The bottom line on this camera is that if you shoot video for just about any reason, you should pick one of these up so that you can add high-speed captures to your bag of tricks. It’s cheap and easy and the results are worth it. The normal stills from the camera are also good (not great) and the features are adequate for a highly portable point and shoot camera. So, the first couple here are videos I grabbed, and then I found a few others folks had loaded up as well. Enjoy! This high speed video was taken with a Casio EX-FC100 digital camera at 210 frames per second. It is a brief clip of only a couple of seconds from a lightning storm, but the high speed recording was stretched out to about 30 seconds to slow it down. Now you can actually see the lightning for a few seconds per flash, even though it happened faster than the blink of an eye in real life. Close up video taken with the Casio EX-FC100 to demonstrate the 210 fps video mode of a bird in flight. Here is a 6 minute video compilation of a bunch of shots taken outdoors on a sunny day. Looks very good. Fish, frogs, dogs, ping pong, bicycles, you name it! The high speed video above is kind of small because the camera doesn’t record in full High Definition mode. However, here is a sample of what the camera can do in the high def mode. If you go over to the YouTube site to watch this one you can see it in 873×525 resolution. Just click on the little HD icon down in the bottom bar of the video player. Keep in mind the video is also compressed, so it would look even better straight out of the camera. Have you shot through an apple and videotaped it at 1000 “fps”? Hi John, it was great meeting you at Cali’s meetup last week. This morning I was googling “high speed video” and this blog entry came up! I’m wondering if you’ve heard anything about new models from Casio with improved resolution for the high-speed video setting? I bought an EX-F1 last year especially for the high-speed video, but I’m finding that the resolution just isn’t good enough. Unfortunately, it seems like the only alternatives are much pricier. Hey Mike, great hanging with you last week too! As far as the Casios are concerned… I also had an EX-F1 until it broke. Actually I had TWO of them and both broke! 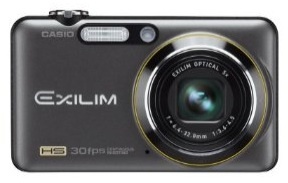 But I later got a Casio EX-FH25. It’s not exactly high resolution, but if you shoot at 240 fps as opposed to like 1,000 its still clear enough to be usable even when clipped together with some other high resolution footage.